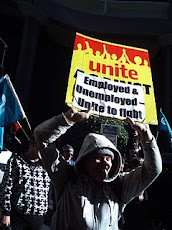 Waitemata Branch’s activities during the year 2013-2014 have consisted of advocacy for members with benefit issues, public comment on issues affecting beneficiaries, the initiation of meetings and protests and the participation in protest actions organised by others. In the field of advocacy we have had one victory at a Benefits Review Committee hearing in a case where a member had had his benefit stopped allegedly for failing to fulfil job-seeking obligations. The outcome was reinstatement of benefit with back-payment of lost entitlements. The case demonstrated the value of taking matters to the Review Committee with peer support. Had this not been given our member would have been grievously victimised. The main issue on which Waitemata Branch has commented publicly has been Work Capability Assessments and WINZ use of designated doctors to achieve arbitrary targets in the number of benefits granted. The invaluable information obtained by one of our associates under the official information act has been posted on our blog along with other commentary on the benefit reforms. I as secretary also wrote an open letter to the Royal Australasian College of Physicians criticising the position paper on the Health Benefits of Work put out by its Faculty of Occupational and Environmental Medicine, which WINZ saw fit to quote on it Work Capacity Certificates, despite a faulty methodology which if consistently applied would return NZ to the Victorian era of child labour. The open letter was sent to the CTU and some of its unions that had signed up to the FOEM's Consensus Statement but (shamefully) no response has been received. An abridged version of the letter was published in the NZ Medical Journal but as that journal is accessible only to subscribers I don't know how it the letter was received by the medical profession at large. 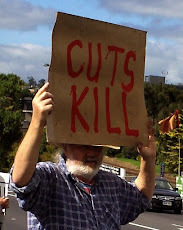 At our last monthly meeting the branch resolved to call on the PSA to recognise, in view of the tragic shootings at the Ashburton WINZ office, that the benefit reforms have turned WINZ offices into lethal environments and to organise appropriate industrial action under the Health and Safety provisions of the ERA. A remit to be put to this meeting addresses this issue. 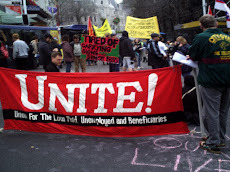 When it became apparent that there would be no Mayday parade in 2014 Waitemata Branch undertook to organise a Mayday forum at Trades Hall which had quite a good turnout. 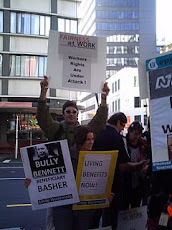 We initiated protests at two of Paula Bennett's public meetings in the lead up to the election. At one of these our vice president was assaulted by the police for attempting to get too close to Bill English who stood in for PB whose plane was delayed by fog. Neither of these protests was well supported by other groups, though a competing event excuses this n the latter case. The housing crisis and the defence of state tenants have this year become one of our major preoccupations. Individual members have continued to attend meetings of the Tamaki Housing Action Group and reported on proceedings. Other sources have confirmed 'our man's impression that the struggle in GI was subordinated to Mana's electoral politics. Only recently did I hear about a picket in May which temporarily delayed the removal of a state house. 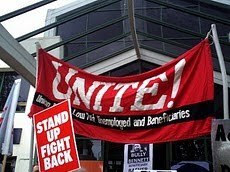 Recognising that GI is geographically too remote for most of our members to participate, our branch resolved to support the state tenants' struggle wherever we could closer to home. 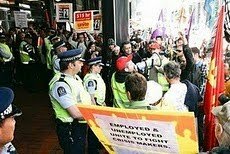 We invited Gael Baldock to address our June branch meeting re her own struggle in Grey Lynn and contribute toward the publicity costs for the public meeting her support committee organised at Trades Hall. We heartily congratulate her on the victory she has since won in the tenancy tribunal. Along the way her struggle has exposed the chicanery of a once proud Housing NZ now dedicated to serving the Nats neo-liberal agenda. With a view to supporting struggles in Grey Lynn and GI we committed to collaborating with other parties in organising a public meeting in West Auckland on the housing crisis. However of the parties contacted none showed an interest- until we heard of the Housing Call 2 Action network that independently was publicising the related issue of homelessness. At the public meeting they organised (which was addressed by rival electoral candidates) we distributed a leaflet calling on working class people to make themselves available for pickets in defence of state houses. That no-one signed up to a contact register revealed a lamentable reliance on parliamentarians who solve a housing crisis they have allowed to happen. Foremost among the protest marches we have supported have been the CPAG's march against child poverty and the series of solidarity marches for Gaza when it was under assault again from the might of the IDF. We voted $100 towards the Kia Ora Gaza relief fund.